머리에 두건을 쓴 지장보살상으로 바위형태의 대좌에 앉아 있는 모습이다. 전체 높이가 33.4㎝ 정도의 작은 불상으로 몸체는 두껍게 도금이 되어 있고 대좌는 붉은 빛이 도는 칠을 하였다. 결가부좌한 모습의 지장보살상은 약간 앞으로 고개를 숙이고 있으며 목은 짧게 표현되었다. 양 어깨를 모두 감싼 옷을 입고 왼손에 보주를 들고 있다. 머리와 몸에 비해 다리와 양손이 작게 표현되어 있고, 조선시대 불교조각품으로는 드문 소형 석조상이다. 특이한 바위형태의 대좌 뒷면에는 이 불상 조성 배경 및 시주자와 제작자, 제작연대를 밝혀주는 글이 새겨져 있다. 조선 중종 10년(1515)에 만들어진 이 석조지장보살좌상은 각 부분의 표현이 간략하나 시대적인 특징을 잘 드러내고 있으며, 그 형태가 잘 보존되어 있고 조성 배경이나 연대가 확실하다는 점에서 매우 중요한 가치가 있다. 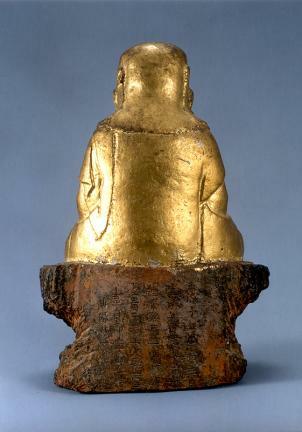 This is an image (height: 33.4cm) of Ksitigarbha Bodhisattva wearing a hood and sitting on a rock-shaped pedestal. The body has thick gold plating, and the pedestal is painted in a color tinged with red. The cross-legged Ksitigarbha Bodhisattva has his head bent forward slightly. The robe is hung on both shoulders, with the left hand holding up a magic bead. The legs and the hands are depicted as small compared to the body and the head. 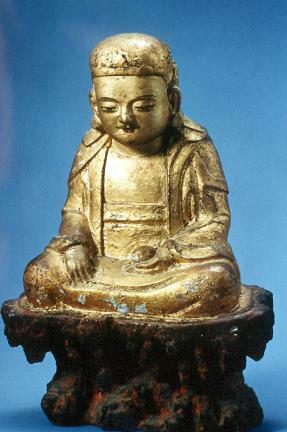 It is a small stone image for a Buddhism-associated work made in the Joseon Period (1392-1910). 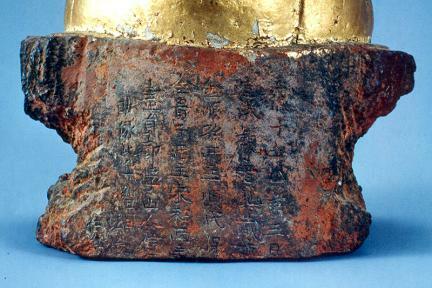 The unique-looking stone pedestal contains statements at the back on how and when the image was made, who made it, and who paid for the work. Made in 1515 (the 10th year of King Jungjong’s reign), the image displays the characters of the period despite the brief expression of body parts. Well-preserved, it is a valuable object that provides clear information on the background and period of formation.